I was holding off on my next coaching session until I felt I had firmly grasped and put to good use the first two sessions. After playing for about 2 weeks, I was ready for the next step. We covered a lot, and as usual, I spent a good day afterwards listening to my recording of the session, taking notes, and compiling them into an “exec summary” that I can read to refresh my memory before I play until it’s fully learned. Since my last lesson, I’ve played almost 11 hours – which isn’t really as much as I’d like, but I’ve been watching videos, reading articles, posting hand histories, studying others, and reviewing my own hand histories after each session – and honestly this takes way more time than you’d expect. Out of six sessions total, I’ve been a winner in five of them and I’m up 7 buy-ins, which is awesome. It’s amazing how joining the video site and getting some coaching can improve your game. There are so many people out there who think they just can’t be helped by a coach. Terribly wrong…but please, don’t get one, cause I like taking your money. I find myself not able to fit all the learning I’d like to do into the time I have available. I also find myself easily playing longer sessions and instead of feeling like “Is my time up?” – I just want to keep playing. I guess winding down from Microsoft takes about 10 months. While I always believe in my abilities, it’s nice to be putting up some good profit and feeling like there’s no where but up to go. The other interesting thing is that now when I sit down at a table, there’s almost no one I’m “scared” of playing. This is a definite change from before where some of the regulars at my level would run me over. Now I just feel like while I might lose in the short term, my studying is paying off quickly. Oh yeah, and GO BRONCOS!!! 5-0. And Monday Night this week! Awesome. I did decide to hire a coach from DuecesCracked (DC). I paid for 6 sessions and I’ve used up 3 of them (in only 2 sessions). For the first lesson, we watched the 45 minute video I recorded of my play. He pointed out various things I should be differently or not at all. I’d say it was a good session and I learned about a few leaks. He lives in Orlando, so I recorded our Skype call and then went back and took notes in detail. This was super helpful as it cemented the information in my brain. Brian: So this next hand, I assume you wouldn’t cbet here. Coach: Nope, I’d definitely cbet. Brian: Ok, well this next one, there’s no way. Coach: I’d cbet here too. Obviously he explained his thinking, but you get the point. I should have been cbetting close to 75%. It’s difficult to cbet when you have nothing, but when you start doing it and realize people just fold most of the time, it’s basically printing money. We covered a lot of other misc stuff in the session as well, but this was the focus. It was amazing how much my brain thinks differently now about cbetting, the flop texture, and how others are cbetting. Definitely worth my money. Here’s a progression of my cbet% through September. In any case, for those that don’t know, I had dropped down to 6-12 tabling 25NL (buy-in = $25; blinds = .10/.25) during my 3.5 month downswing. After my coaching sessions, my goal is to work back up to the 100NL and 200NL games by January-ish. I want to play at least 100k hands at 25NL and make sure I’m crushing it before I move to 50NL, and do the same thing there. That just takes time. I’m probably being over conservative, but that’s okay. So I was playing 2 days ago, and felt like I was playing well. I was coming off of two good poker sessions after both of my coaching sessions. But the day just didn’t cooperate. I played about 5000 hands throughout the day, and was up almost one buy-in at my high point. I ended the day down almost 6 buy-ins. Ugh. I realize these days will happen, however, it would make them a lot easier to handle if my up days were equal in magnitude. I have 2-4 buy-in wins frequently, but never really 6 or more. Overall a brutal day. The next day, I sat down to play, and started off the same way, dropping 2 buy-ins in the first 1k hands. Frustrating. I was complaining to my coach and sending him a few hands that were just brutal. I’d make a straight and someone would have flopped a full house. His response was “variance imo”. I know that but it felt a little better to complain. 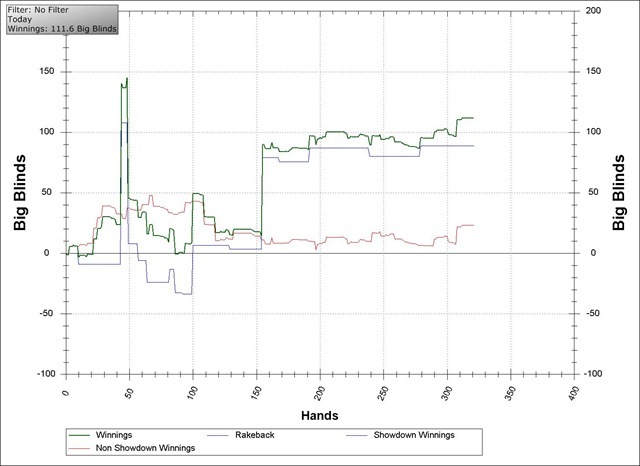 I needed to play about 5k hands today to make my “Gold” rating by the end of the month on Pokerstars. This is about 6 hours of play so I was on the clock. What a difference a day makes. 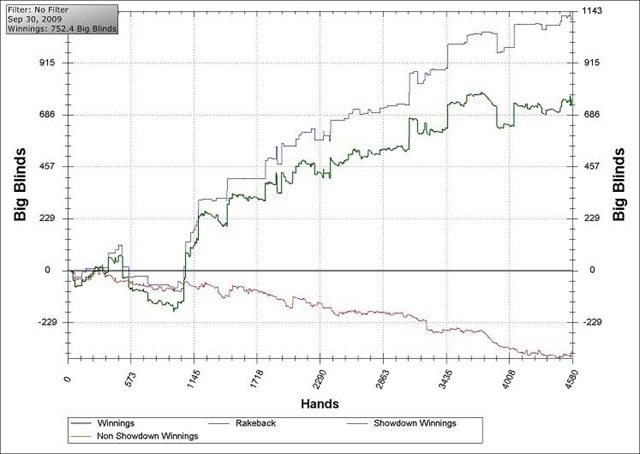 I guess the poker gods heard me because this was my graph at the end of the day – up 7.5 buy-ins. Excellent! The green line is actual winnings. The blue and red lines (see previous post) are my Showdown and Non-SD earnings. I have been working on making sure the red line is not sloping down as fast as the blue line is sloping up…and you can see it’s working here.